Perfect engraved beer tankard glass makes a great keepsake gift for any Father of the Bride or Groom. Or why not add a personalised touch to your wedding table settings with a personalised glass for your wedding party. The Glass is available in 2 designs either Father of the Bride or Father of the Groom. 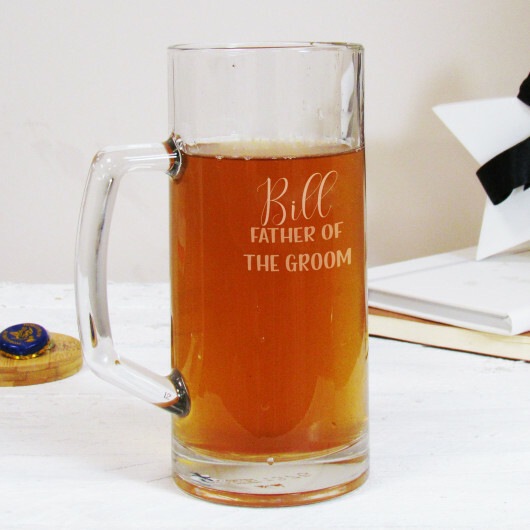 You can personalised the glass with a name of up to 15 characters which will apear above the 'FATHER OF THE BRIDE' or 'FATHER OF THE GROOM' standard text.